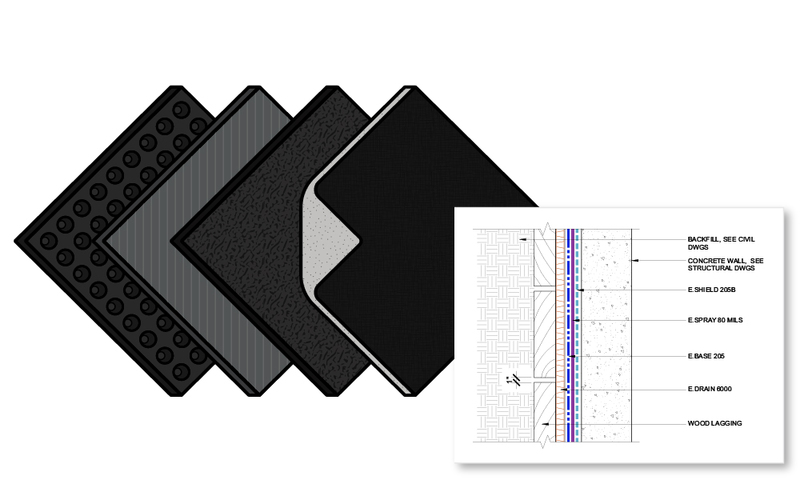 Choose the EPRO Blindside Waterproofing Protection System Assembly That’s Right for the Job. 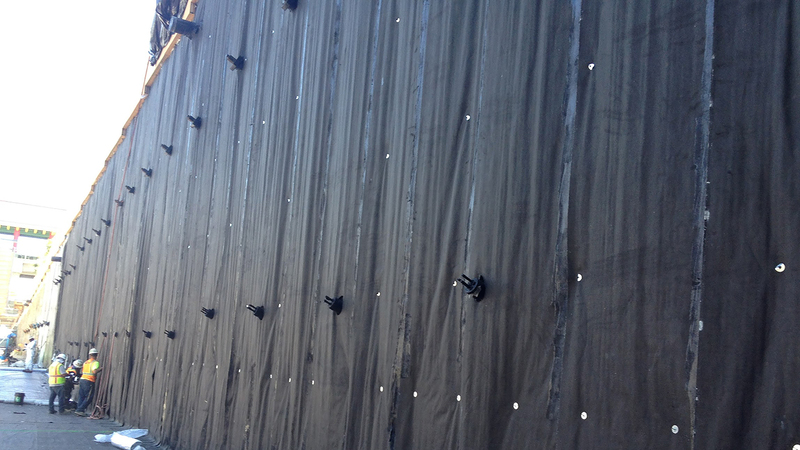 EPRO Shoring Systems provides blindside vertical protection against nuisance water, perched water, or groundwater. They are also used to protect against the lateral migration of various contaminated vapors and methane gas. Designed for various shoring applications including: soldier pile, back lagging, soil nail, internal rakers, secant walls and sheet pile; these systems are also compatible for use with shotcrete and poured walls. Designed to provide the most redundant and highest level of below grade building protection of the E.Series systems, E.Protect+ provides unparalleled protection by creating a fully bonded system utilizing multiple types of waterproofing. E.Protect+ Shoring is the first system ever developed to combine in one system, what others might utilize as three completely independent systems. E.Protect+ Shoring is designed for those who require the highest level of performance. It is compatible with cast-in-place poured concrete or shotcrete, and when applied to different types of shoring methods including soldier pile, back lagging, shotcrete soil nail, internal rakers, caissons, secant walls, and sheet piles. 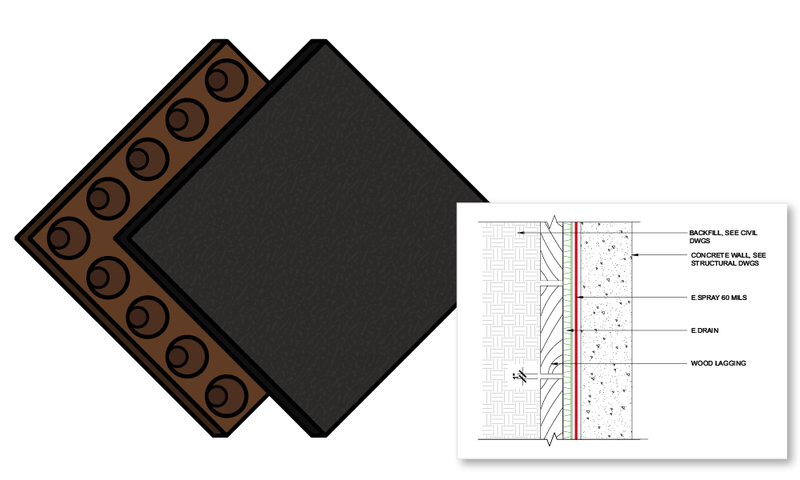 Designed for projects requiring a high level of performance with some budget constraints. 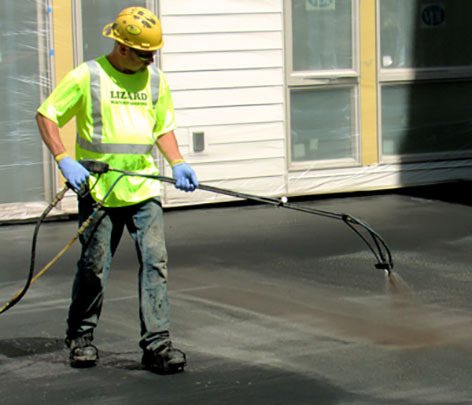 E.Protect Shoring leverages three key waterproofing materials: high-density polyethylene (HPDE), spray-applied polymer modified asphalt (PMA), and bentonite, to create redundancy against a wide range of project conditions and chemicals of concern. When used in conjunction with the E.Proformance Underslab system, a single source warranty is available for both waterproofing, and contamination such as, methane gas, volatile organic compounds (VOC’s), or aeromantic hydrocarbons. 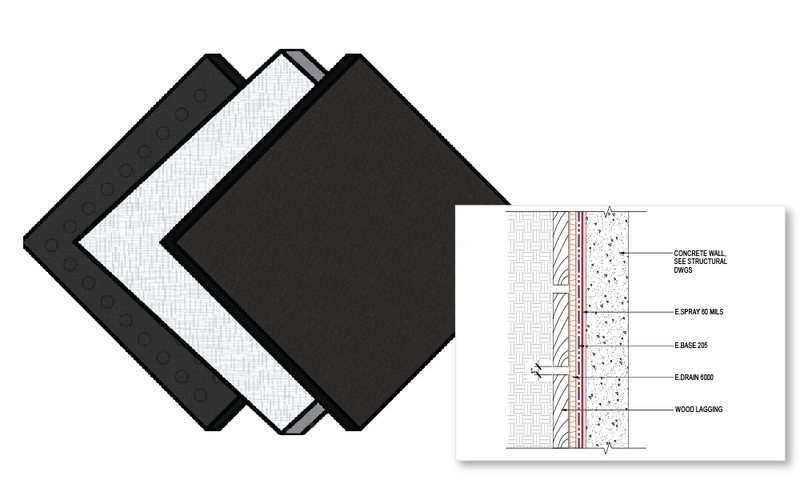 E.Proformance Shoring can also be applied without an underslab barrier for sites with minimal waterproofing risk, or in conjunction with other E.Series systems when above the design water table. 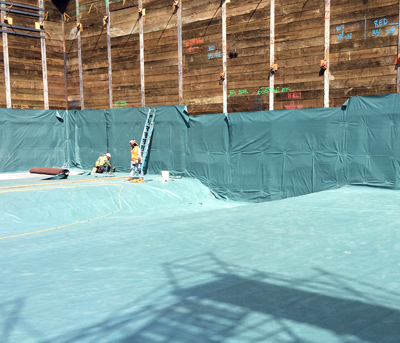 Providing a variation to the standard E.Proformance Shoring system to accommodate for the shrinkage of below grade vertical walls, 60 mils of e.spray is applied directly to the geotexile face of e.base 205 to provide a tenacious bond directly to the concrete wall. 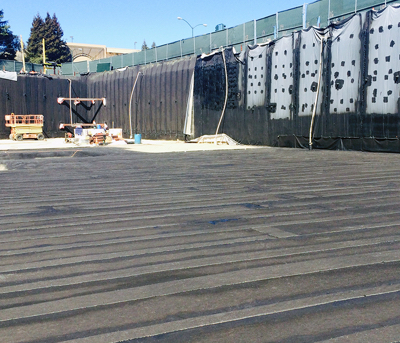 E.Proformance Slipsheet is ideal for sites with underslab drainage, minimal waterproofing risk, or in conjunction with other E.Series systems after transitioning above the water table. It is compatible with cast-in-place poured concrete or shotcrete, and may be applied to different types of shoring methods including soldier pile, back lagging, shotcrete soil nail, internal rakers, caissons, secant walls, and sheet piles.